Daniela Cherilen graduated from the CLM program on Thursday, January 24th. We wrote of her once before. You can find the first profile here. A lot has happened in the eighteen months since she joined the program. Her life, at the time, had reached a low-point. Her family was trapped in a downward spiral because of her husband’s illness. Various stomach ailments had weakened him to the point that he could not work. As Daniela put it, “Se mwen ki rele, se mwem ki reponn.” She said that in June, and she repeated it the week of her graduation. That’s like saying, “I’m the one who shouts, and I’m the one who answers.” It’s a way that rural Haitians have of saying that everything depends on one person, in this case Daniela. When we spoke to her in June, she was feeding her family with a small business she had created with 1500 gourds that she saved from her weekly CLM stipend. She would buy limes, hot peppers, or other high-value produce from farmers, and sell it retail in the Gwomòn market. She had just made an important investment decision. She had taken 1000 gourds out of her business to buy the harvest from a series of mango trees. It meant that she had to run her little business temporarily with only 500 gourds, but it enabled her to make a 750-gourd profit when she sold the mangos. She put that money, along with the original capital, back into her produce business. She is now facing graduation, however, with no business at all. She spent much of the capital to send her children to school this year, and then spent the last few gourds buying the cement she needed to complete repairs of her home, which was damaged in the earthquakes that shook the Gwomòn area in October. 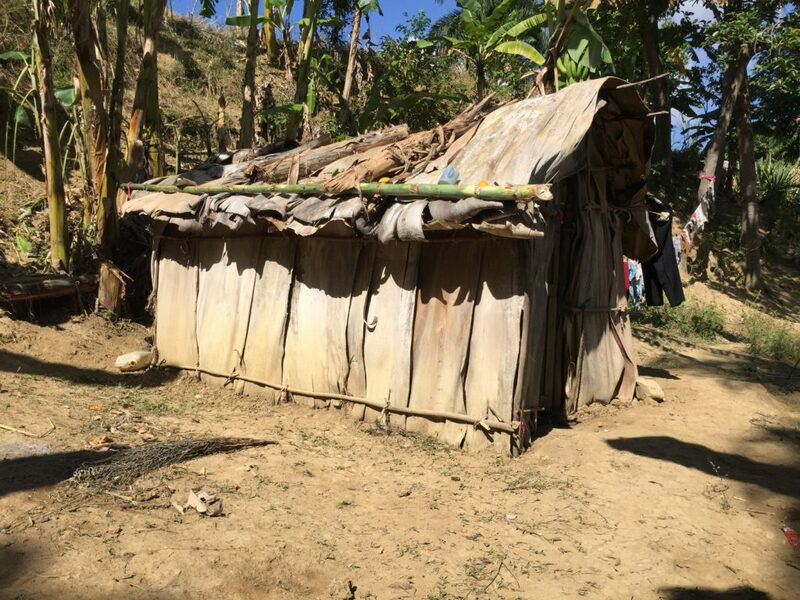 CLM was able to provide special help to the families whose homes were damaged by the earthquake, but Daniela wanted to do more than the minimum that the CLM funds were designed to finance. She wanted to buy extra cement to cover the walls. So she had to raise extra money. Her long-term plan includes a focus on farming. “We rent land to farm, and we eventually want to plant sugarcane.” There’s more money in sugarcane than most other crops, but it’s a longer-term investment and, unlike other crops, it doesn’t directly help feed her kids. Choosing cane depends on her confidence that she can meet the family’s daily needs in other ways. When asked how the CLM program helped her, Daniela is effusive. She talks about the home she used to live in. “Anytime it rained, I was under water.” She talks about learning to save, too. She uses both her VSLA and a Fonkoze savings account to put money aside. Most importantly, she talks about her husband. 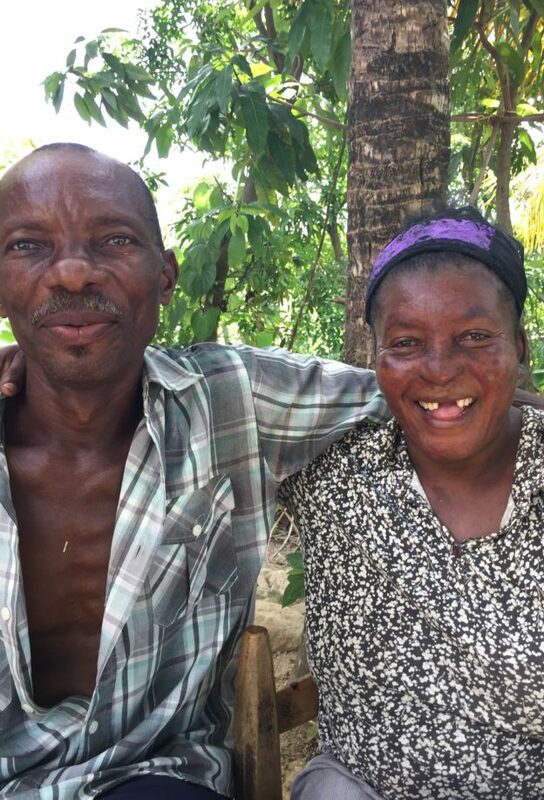 “If it were not for CLM, my husband wouldn’t be alive.” She had lost all hope of saving him. He had grown so weak that he couldn’t even get onto a motorcycle to get to the hospital. 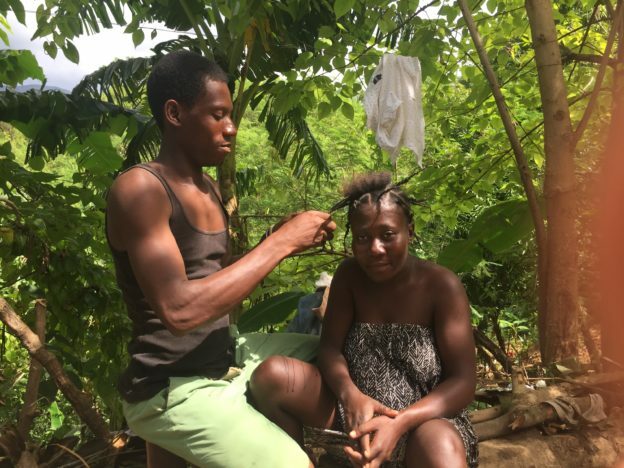 The CLM team got him to the local hospital, and when that didn’t help they brought him to see specialists at the university hospital in Mibalè, almost four hours from her home. 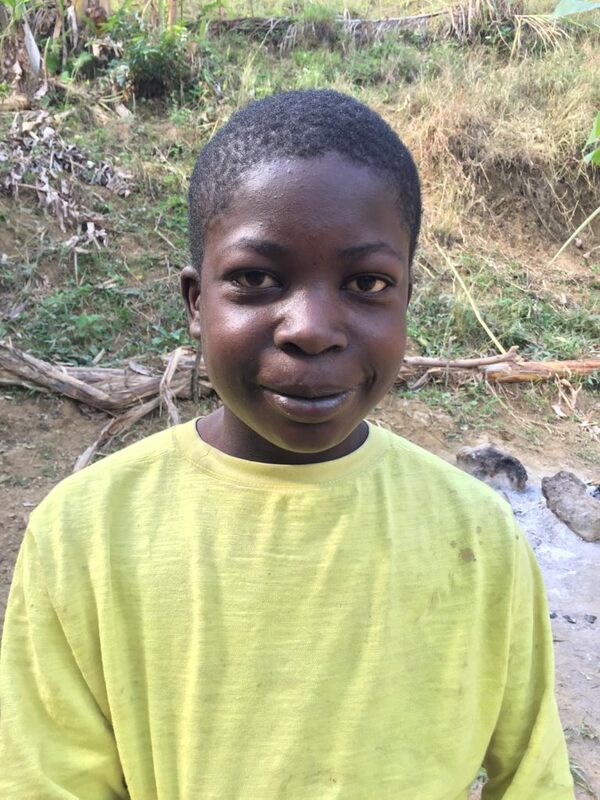 He’s now healthy again, and working with Daniela to manage their household. Daniela in front of her new house. Her old, straw-roofed home is in the back. This entry was posted in Chemen Lavi Miyo on January 25, 2019 by Steven Werlin. Idalia Bernadin graduated from the CLM program in February 2018. 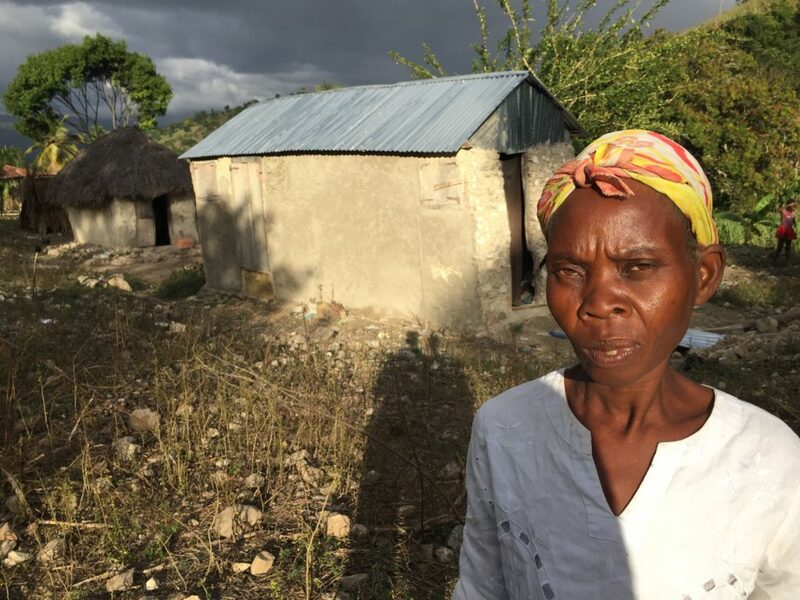 At the time, she was living in Gwo Labou, a hillside community overlooking the river that cuts through Savanèt, a commune in the southeast corner of Haiti’s Central Plateau. 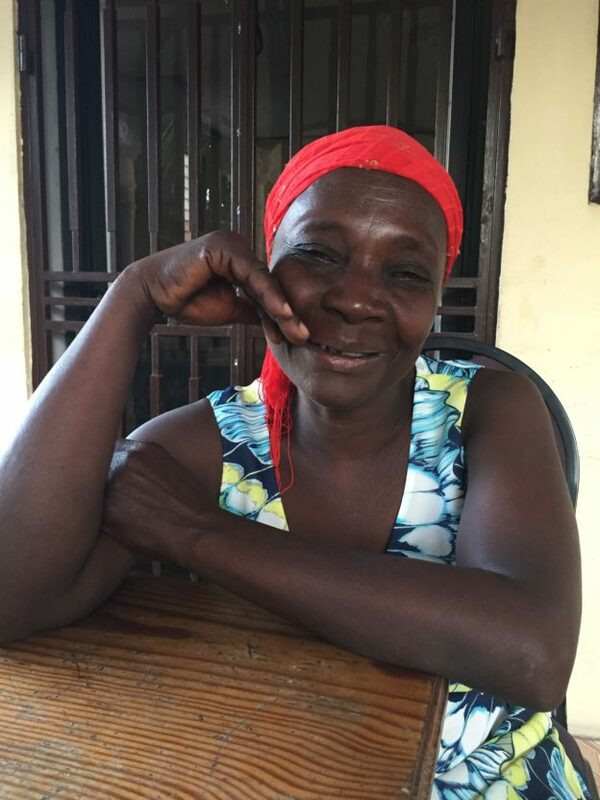 She and her husband, Villon, had moved to Gwo Labou at a low point in their lives. The second of their four sons had just been arrested, and they had felt forced to abandoned their home in Kadèt, in the valley across the mountain from Gwo Labou. Kadèt is in a hard-to-access corner of Kòniyon, the next commune to the south. Villon had been accused of theft. Neighbors said he stole a bunch of plantains out of a garden, and Idalia’s efforts to come to his defense only made things worse. So, they abandoned a home with a good tin roof, on land that Idalia had purchased by selling off some of her inheritance. They moved in with Villon’s sister and her husband. When the CLM team met them shortly after the move, they were, thus, landless and homeless. They had nothing. Villon tried to continue to work their fields in and near Kadèt, but they are a long hike from Gwo Labou, and his reputation as a thief made it difficult for him to appear in the neighborhood. The couple didn’t have land in Gwo Labou, so they tried to get by working in their neighbors’ fields. The CLM team helped them gain access to a small plot of land, so they were able to build a house. Many CLM members work hard to make the biggest, nicest houses they can while they are in the program. Three- and even four-room houses are common, though the program only provides some of the materials for a small, two-room one. Members choose to make the extra expense to take advantage of the opportunity CLM offers them, even if doing so uses up capital that they could use in other important ways. Idalia was different. She and Villon did as little as they could get away with. They built only one small room. In fact, they had to do so twice, because their first effort was so perfunctory that the CLM director responsible for the region wouldn’t accept it as a bona fidehome. As short as all the members of the family are, even they could barely stand up in that first construction. But as glad as Idalia and Villon were that the CLM program had found them, they didn’t want to live in Gwo Labou. Their plan was to remain in the area just long enough to graduate from the program, and then move back across the mountains to Kòniyon. They felt unwelcome in Gwo Labou. The man who made their plot of land available clearly wanted them off of it. He was planting his crops closer and closer to their front door. And they never really made friends there. It took them a couple of months to prepare their move, but they were back in Kòniyon by June, just four months after graduation. They sold their house for 4000 gourds, or almost $60 at the time, and used most of the money to buy a goat. They sold their large pig as well. Getting it over the mountain to Kadèt would have been a challenge. When they returned to Kòniyon, they bought two smaller ones with the money. There is plenty of good forage where they now live, so Idalia is couting on pig-rearing as a main source of income. They did not feel comfortable moving back to their old house in Kadèt. The accusations of theft still haunted Villon there. “That house is still ours.” Idalia explains, “We have four boys, and one of them can take it.” Villon had some land he inherited in Frijè, a neighborhood deeper in the valley than Kadèt, and they built a small shack on it, enough for the couple and their youngest son, Dalison, the only child still living with them. He’s in his mid-teens, and Idalia started sending him to school when she joined the program. He’s in school again this year, though he’s having to repeat first grade. His sickness last year made attendance to spotty. When she moved to Frijè, Idalia decided that she needed to do something to earn a steady income. Her livestock could increase its value, but she would need much of that money at first to build her new house. She and Villon have farmland in both Frijè and Kadèt, and they would occasionally have harvest to sell, but only a few times each year. Villon works hard. He makes charcoal for neighbors and splits the proceeds with them, but that work is irregular. So, she decided to establish a small commerce. As that first money evaporated, she knew she had to come up with a different business plan. So, she went to the market in Pòtino with 1000 gourds of the proceeds from the sale of a crop of beans. She bought basic provisions: rice, sugar, oil, seasonings, etc., and began selling them out of her home. She now makes the trip to Pòtino every Sunday to restock. She still has trouble collecting what people owe her sometimes, but she’s found a wholesaler in the market who will sell her on credit when she needs it, so she’s able to keep her business going. It’s enough to manage her household expenses, at least when it’s combined with their farming and other activities. Her poultry is starting to flourish, too. She just sold two small roosters to buy a cellphone. She’s optimistic about her future. Her son was released from prison. He behaved so well while inside that one of the guards now pays for him to go to school. He’s now living in Pòtoprens with family so that he can take advantage of the opportunity. She’s focused on building a new house. She knows it will take some time, but one of her goats just had kids, and that’s just the sort of progress she needs to make. There is one more piece of this story I should share that speaks to Idalia and her relation to our program. It is hard to express just how out-of-the-way Frijè is. I was in Mable, in the mountains near the border between Savanèt and Kòniyon, when I went to look for her. I knew she had family living near Mable, so I was able to get some information there about where I might find her new home. But it was a hike of more than three hours each way, and coming back was uphill. I found the home, but did not find her there. I had a long talk with Dalison, whom I know well from some time he spent in the hospital in Mibalè. I learned a lot about the family and the changes they had made since moving, but I didn’t get to talk with Idalia. She was at the Kourèt market, selling the roosters and buying her phone. This entry was posted in After Graduation, Chemen Lavi Miyo, Graduates Who Migrate, The Women of Kolonbyè on January 5, 2019 by Steven Werlin. Rosemène Jacques lives in Nan Kafe, a neighborhood on the northwest side of Mable. Though she grew up in Nan Kafe, she hasn’t been living there long. When she was young, she met and fell in love with a man from Gaskoy, along the river that cuts through the valley to the northwest, and she moved down the mountain to live with him there. They lived in a house in his parent’s yard, and the couple had two children. The man, however, got into a dispute with his brothers over their inheritance, and Rosemène says the brothers killed him. She was visiting her mother in Nan Kafe with her children at the time, and she went down to sell the couple’s cow and hold the funeral. The man’s family cleaned out all the other possessions that the couple had accumulated. Immediately after burying her husband, she returned to Nan Kafe to stay. She eventually got together with another man, and they had a first child together. She likes the way he treats her other children. “He helps me send them to school.” That is especially important to Rosemène because the kids lost two years of school after their father died. She was pregnant again this year, but the baby was stillborn. She would rather not have another child right now. This entry was posted in Chemen Lavi Miyo on December 21, 2018 by Steven Werlin. 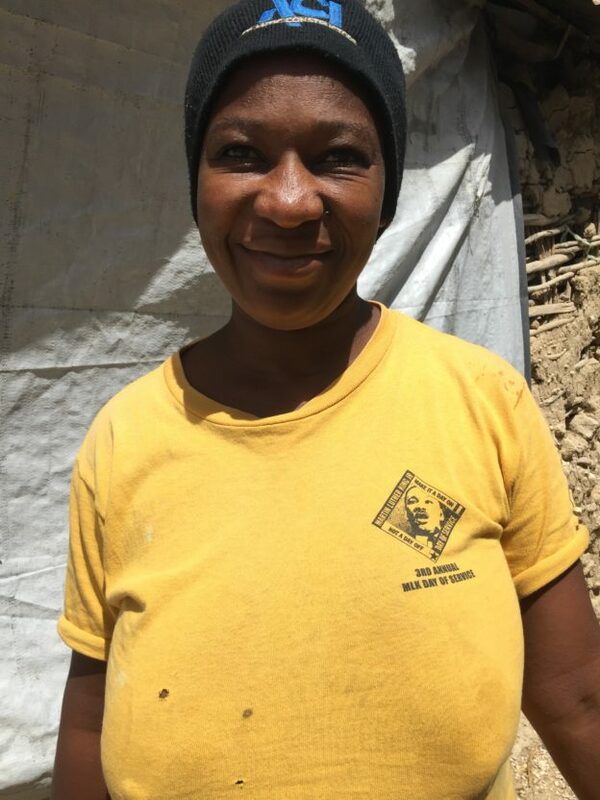 Jeannette lives in Mable, a remote corner in the mountains that separate Haiti’s Central Plateau from the plain to the north of Pòtoprens. She lives there with her husband, Charles, and their three young boys. Though she and Charles are both from Mable, they had just returned to the area when the CLM team was selecting new families for the program. They had spent a couple of years away in Mibalè. Charles had been involved in a conflict with one of his uncles about land, so he and Jeannette moved with the kids. The couple spent two years struggling to rent a room there and to send the children to school. Forced to move away from their land, which had been their main source of income, they couldn’t make ends meet. They sold off their livestock, and eventually ran out of money. 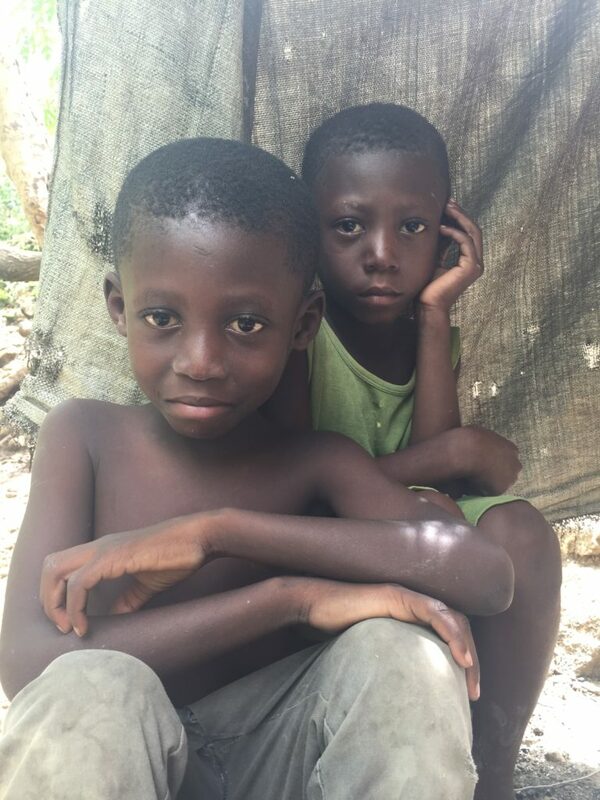 They were forced to move back to Mable, build a small shack, and return to farming. They didn’t have their own land. They had never been able to buy any. But they could work their family’s land. They needed to be fast and determined, however, because others who had similar claims to the land could move onto it and work it if Jeannette and Charles left it idle. The program gave the couple two goats and a pig, and the couple took good care of them. The two goats became eight, and their sow had six piglets, five of which survived. But as they saw themselves flourishing, the couple also worried. They felt that their neighbors were jealous of their goats, and the goats were getting to be too many to keep a close eye on. So, they sold six of them to buy small heifer. They even had enough left over to buy a small hog for fattening. They hope to sell the hog in February, when their children’s school bills will be due. Buying a hog seemed important because they had already sold their sow and her piglets. They needed the money from that sale to complete their house. Home repair and construction has always been a principal part of the CLM program. Originally, it was added to the program the team inherited from Bangladesh for two reasons. First, Fonkoze felt that program members needed a good roof over their heads to stay healthy. Most lived in improvised shacks that cannot protect them from the elements. Second, Fonkoze wanted all members to have a secure place to store their things. This was especially true for the women who established a commerce and had merchandise to look after. But home repair — in most cases, it is home construction, because the family has nothing worth repairing — has gradually become more central to the program. The team has made the housing-related graduation criterion increasingly demanding. In 2010, the house just needed to be walled in and covered with a good tin roof. Gradually, the team moved towards specifying completion of all the finishing touches: such as doors, windows, and the drop ceilings that close off the part of the roof that extends beyond the house to form a front porch. But more importantly, home construction has become a more substantial portion of a family’s accomplishments. Fonkoze always insisted that families take on much of the responsibility for their house. The program provides some combination of roofing material, cement, and nails. It also pays a builder. But the family needs to come up with all the structural lumber that’s necessary and the materials it will use to build up the walls. This can add up to a lot of expense. Jeannette and Charles spent over 5000 gourds on structural lumber and more than 10,000 on the palm trees they needed to turn into planks for their walls. They needed almost 3000 gourds for nails. They also spent 3750 on additional roofing material, because they wanted to build a larger home than CLM would support. And because their house was larger than a standard CLM house, they also needed additional money to pay builders. In all, the couple spent about $400, which is a lot of money for a family that recently had no means at all to speak of and is much more than the $250 that the CLM program pitches in. But a home represents more than just a central, life-changing addition to a family’s wealth. A home represents the determination, the grit, the strength that it takes to plan and execute its construction. The finished home shows what a family is capable of. CLM members are intensely proud of their new homes. They often describe them in some detail during the testimonies they offer at graduation. A couple like Jeanette and Charles, who can manage the process of building a new home once, will leave the program confident in their ability to move forward. And Fonkoze and its CLM team can be confident in them. This entry was posted in Chemen Lavi Miyo on December 20, 2018 by Steven Werlin. When we first selected her, she, her husband Soiye, and their two boys were living in a small shack he had built on her cousin’s land in the outermost corner of Lalyann, a small community on the northern edge of Mannwa, in Boukankare. Perrona spent a few weeks in the program at that time, but eventually decided to drop out. I remember the conversation we had when she announced her intention. She said that she and Soiye had decided to “fè yon to kanpe.” I understood that to mean that she wanted to take a little break from the program, and answered that we did not offer “breaks.” They were either in the program or out of it. We went back and forth a number of times. I felt strongly that the family needed us, so I wanted to see whether I could change Perrona’s mind. She is a very short woman, so I normally tower over her. But I was standing downhill, and the slope was steep, so she was looking down at me for a change. When I realized that I wasn’t getting anywhere, I accepted her ID card and her pink information book, and made the long hike back to Viyèt, where I had left my motorcycle. Within months, she a Soiye were sorry they had left the program. They both came from poor families, and both had relatives in the program. Soiye’s older sister lived in nearby Boukankola, and Perrona’s mother near Zaboka. Both were making real progress. 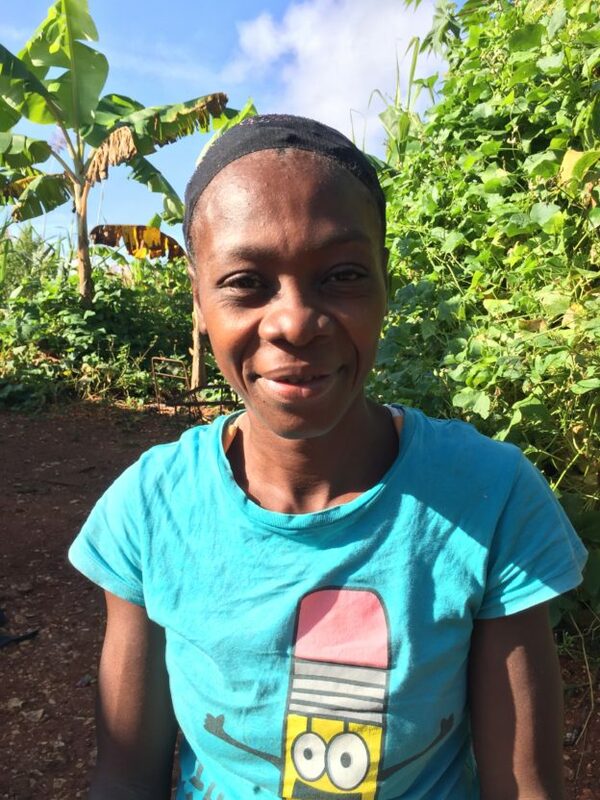 Perrona had allowed jealous neighbors to convince her that the program was the devil’s work, but now both she and her husband were seeing the good it was doing for people they knew very well. Normally, there would have been nothing we could do. We serve one region after another, and when we’ve passed through a neighborhood we do not return. But Perrona had been forced out of her home in Lalyann even before she left the program. She and Soiye had approached her cousin about the opportunity they had as CLM members to build a better house. The cousin had been apologetic, but she had said, “No.” The land was inherited, and she was not the only person with claim to it. She couldn’t allow a permanent structure on it because the others might object. Perrona and Soiye then moved to Nan Joumou, which was right next to an area where we were already selecting a new group of members. So, we simply invited them to join the new group. Their 18 months in that second cohort were challenging. They were able to build a small house on land owned by Soiye’s family, right next to one of his older brothers. And they took good care of the livestock the program gave them. Soiye even established a business that continues to serve as their main source of income even five years later. He buys livestock, primarily poultry, at rural markets and resells them, either at other markets or sometimes even at the very same one. Their biggest challenge had to do with their relationship with each other, and at first the CLM program might have made things worse. They had a very bright and motivated case manager, Titon, who wanted only the best for them. He hit it off with Soiye, and included him in his work with Perrona. 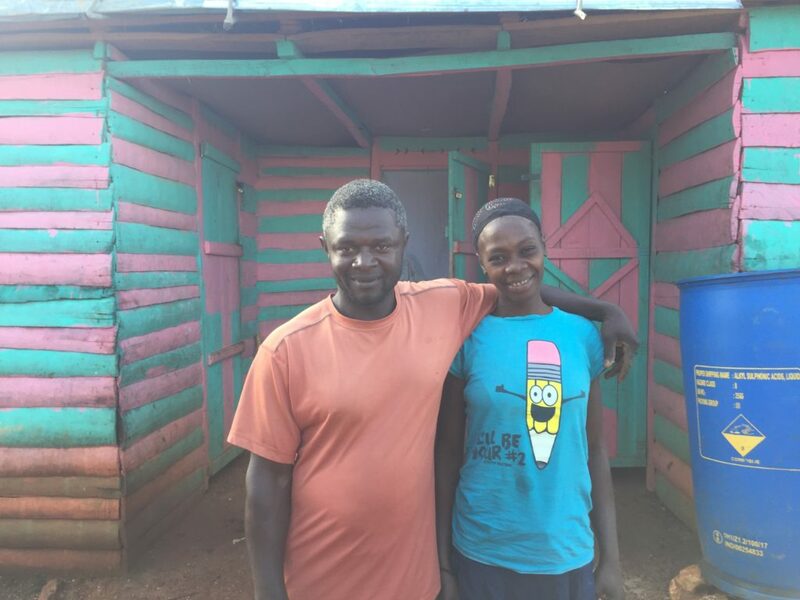 As Soiye’s business took off, he and Titon spent extra time together, Titon feeling perhaps that work with Soiye was the most effective way to help the family progress. But the close relationship between the two men only seemed to add to Perrona’s frustrations. She felt left out. She wanted to leave her in-law’s land in Nan Joumou. She wanted to establish her own small commerce. She wanted to feel more an equal partner. Eventually, she abandoned Soiye and their children, and moved to Mibalè, where she quickly found work as a maid. At this point our situation was complicated. We needed to continue to support the family, but we couldn’t be sure how to do it. Our inclination was to think that they would be best off if they could stay together. We had never, whether from Perrona or elsewhere, heard any suggestion of either abuse or infidelity in the relationship. But Perrona needed to have the freedom to decide what she wanted. And, unfortunately, her case manager had more-or-less disqualified himself from talking her through the issues by having appeared, in her eyes, to have lined up with her husband. So, we called on another case manager, a woman named Sandra. Perrona already knew Sandra slightly because Sandra had worked on the first cohort that Perrona had been part of. She was very happy to talk with her. Sandra first confirmed that Perrona had not suffered abuse and was not accusing Soiye of infidelity. She talked to Perrona, trying to understand what Perrona really wanted. As it turned out, she didn’t want to leave either Soiye or her children, but wouldn’t live in Nan Joumou. She felt trapped there. Now it was time to talk to Soiye. He was angry and hurt that Perrona had left him, but he didn’t want to split up either. He presented two practical problems, however. On one hand, he had crops in the ground. He didn’t want to lose them. He didn’t think he could afford to. On the other, his business involved long hikes through the mountains to distant markets in Nan Sab and Regalis. These markets would be much harder to reach from Mibalè. But the couple eventually reached a compromise. Perrona would return to Nan Joumou and stay there with Soiye through the upcoming harvest, then they would leave the area together. I’m making the path they took look much straighter than it was. There were setbacks and other complications. But five years later they live together in their own house in Mibalè. Soiye still deals in poultry, but instead of hiking to Nan Sab and Regalis, he rides trucks and motorcycles to Mayisad and Nan Kas. Perrona has learned to do business, too. She buys beans in Difayi on Mondays and Domon on Fridays. On Tuesdays, she hikes through Mibalè, selling her beans as she goes, and on Saturdays she sits selling them in the Mibalè market. She buys about 25 cans of them, at 55 gourds per can, and sells them for 60 to 70. “It’s not much, but it helps buy the things we need,” she explains. The couple still has problems. They have four children now, and with their fifth due this month, their expenses are higher than they’ve ever been. Two of their three older children are in school this year, but they are not yet sure how they will send their second boy. And it will be a struggle to pay what they still owe on the land that they are purchasing. They say their fifth child will be their last, but they hadn’t planned to have four, either. This entry was posted in After Graduation, Chemen Lavi Miyo, Graduates Who Migrate on October 8, 2018 by Steven Werlin. I’ve written about Christella before. (Here.) She lives in Labasti, across from the space that becomes the largest market in southern Mibalè every Thursday. On market day, the space along the side of the road, in front of where she sits with her business, fills with dozens of motorcycle taxis, the drivers waiting to take on passengers as they leave the busy market to return downtown, or wherever they need to go. The livestock market across the street has been growing steadily over the last years. Strong demand for meat in Pòtoprens sends buyers who by dozens of animals – goats, pigs, cows, and horses – to truck them into the capital for butchering and distribution. When I first met her, Christella was living in a rented room with two children a short distance north of the same market. The children’s father was starting to pull away from her and his kids, spending more and more time in Pòtoprens and providing less and less support. She wasn’t sure how she would pay the rent when it came due. She had been keeping herself and her children fed by selling fresh vegetables in the market, but she had been doing it with money borrowed from a neighbor, and one week of disastrous sales left her unable to repay what she owed. Soon after that the business collapsed entirely. But her 18 months in CLM were productive. She made great progress, much of it connected with a change in her personal life. She met another man, Michelet. Eventually, they moved in together. We know that progress is much easier for women with reliable partners. That isn’t surprising. Michelet was struggling at the time, just as Christella was. He was a construction worker, but he had broken his leg badly in a motorcycle accident, and the leg had been mis-set, leaving him with a bad limp. Without a crutch, all he could do was hop on one foot. But he was willing to work hard. He brought in small bits of farming income and helped her with the various kinds of work that success in CLM requires: managing livestock, assembling construction materials for home repair and latrine construction, etc. He began earning extra income by working at a roadside tire-repair shop. It was reliable money, but very little. None of the equipment was his, so he owed the owner half of everything he made. When he and Christella saw how much money tire repair could bring in, they came to their case manager with a plan. They would sell out their livestock, which had begun to multiply, and buy a full set of tire repair equipment for Michelet, including a used gas-powered air compressor. The case manager agreed that the investment made sense, so the couple went ahead. Christella graduated in December 2014, easily meeting all the criteria. But that time, Christella had gone back into the vegetable business as well, but it was a very up-and-down endeavor. Selling perishables was always risky. Every once in a while, she’d take a loss, and they’d have to replenish her capital from Michelet’s tire-repair income. But it wasn’t a problem, because he was making enough. They even started replacing the livestock they had sold off to buy his compressor. When the first compressor broke down, they were able to replace it with another. When the second one broke down, they chose not to. They initially used the money they got from selling it to buy more livestock, but eventually they turned around that livestock by selling it to buy a used motorcycle. They paid 22,500 gourds, or about $350. Michelet would start driving a taxi. 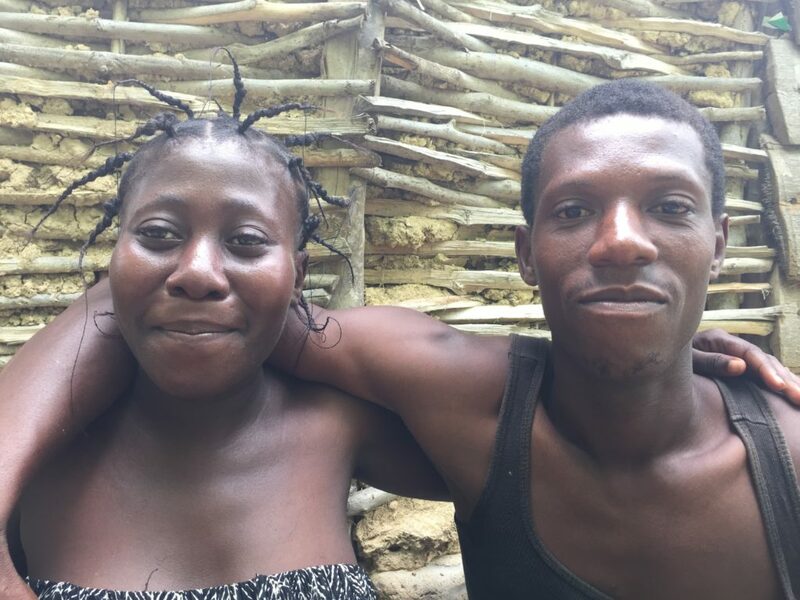 Christella gave him money out of her business to repair the motorcycle, and he took additional money out of a field of sugarcane they had planted together. That’s when things changed for the worse for Christella. “The motorcycle is what broke up my family.” Michelet started getting around more, and he found a girlfriend. Soon he had left Christella. They have two children together, in addition to the two she had when they first met, and Michelet hasn’t been supporting them at all. She now depends entirely on her small business to support herself and all four kids. Those snacks, however, are not her main business. Her main business is cigarettes, snuff, and kleren, the local rum that is popular throughout Haiti. She sells the clear rum, but also knows how to flavor it. Her table usually holds a dozen bottles or more of different rum-based concoctions, flavored with various herbs, spices, or fruits. Cinnamon, passion fruit, and ginger are popular. She buys the raw rum by the barrel for 17,500 gourds. 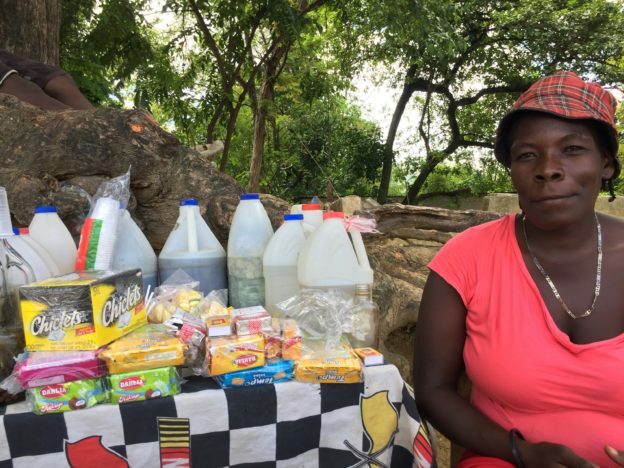 She has wholesale clients, mostly women who have businesses like hers and buy a gallon or two at a time, in addition to her consistent retail trade. This entry was posted in After Graduation, Chemen Lavi Miyo on August 22, 2018 by Steven Werlin. When Aline first saw CLM staff asking a lot of questions in the area around her home in Divye, a small community in Montay Terib, she didn’t know what to make of it. Montay Terib is a hard-to-access area in the mountains of southwestern Sodo. She joined the program in 2012, and chose goats and small commerce as her two enterprises. And for 18 months she worked hard and began to flourish. She built her own small house on a spot of her parents’ land. She took care of her livestock, and her assets multiplied. By the time she graduated, she had six goats and a small cow. She also built up her commerce. She would make the weekly hike down to the regional market at Kay Micho, in southern Sodo, and hike back up to Montay Terib with her merchandise. She sold basic groceries—oil and rice, for example – at the mountain market at Ka Boudou. Within a couple of years, however, things took a turn for the worse when her mother died. Funerals are expensive in Haiti, and her one sibling, a sister, was already struggling to get by in Kabare, the closest large town. Much of the expense of the funeral fell on Aline. She was able to manage without taking on debt, but it meant selling most of her livestock. That meant that the full burden of school expenses would have to fall on her business, but she tried to plow ahead nonetheless. She began, however, to notice that her father seemed to have turned against her, showing signs that he didn’t want her around. To this day, she is not sure why. He started to plant his crops closer and closer to her front door, leaving her and her children less and less living space. 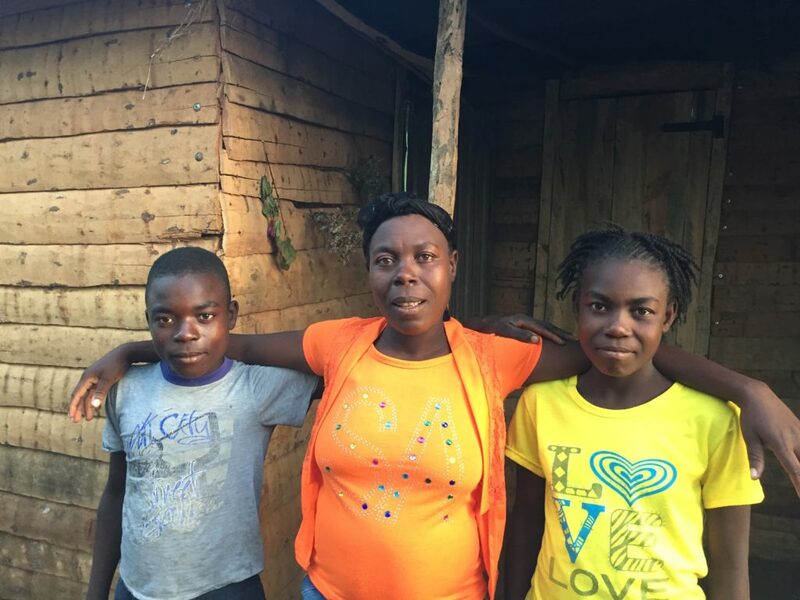 She finally made the only decision she thought she could, abandoning her house in Montay Terib, renting a room in Kabare, and moving there with her children. By now she had five. She knew that she would need a different business living in Kabare, so she came up with a plan. She would buy 2-3 sacks of charcoal at a time, and sell small bags of it retail. A commerce like this one, often called “kase lote,” which means to break into piles, is a key step in the distribution of agricultural goods across Haiti. For something like charcoal, there are smaller and larger rural producers. They might make as few a one or as many as a half-dozen or even more sacks at a time. They either bring them to market or sell them to local merchants, usually women, who bring them to market instead. When they get to market, the sacks are purchased by other businesswomen, who sell them in turn to retail sellers like Aline. But it was hard. School costs for the children were higher in Kabare, and she was now paying rent. The strain on her business was considerable. She met a man, and became pregnant. It was a hard pregnancy. She was sick much of the time. It made it harder for her to work every day, and every day she missed was a reduction in her sales. And the expense of going to the hospital and buying medication was an additional drain. She was able to get her kids through the school year, but at the end of the year she sent the four older children to Montay Terib for the summer. They are staying with their paternal grandmother. Aline says they are enjoying the mangos. But Aline’s business finally collapsed shortly before she gave birth. 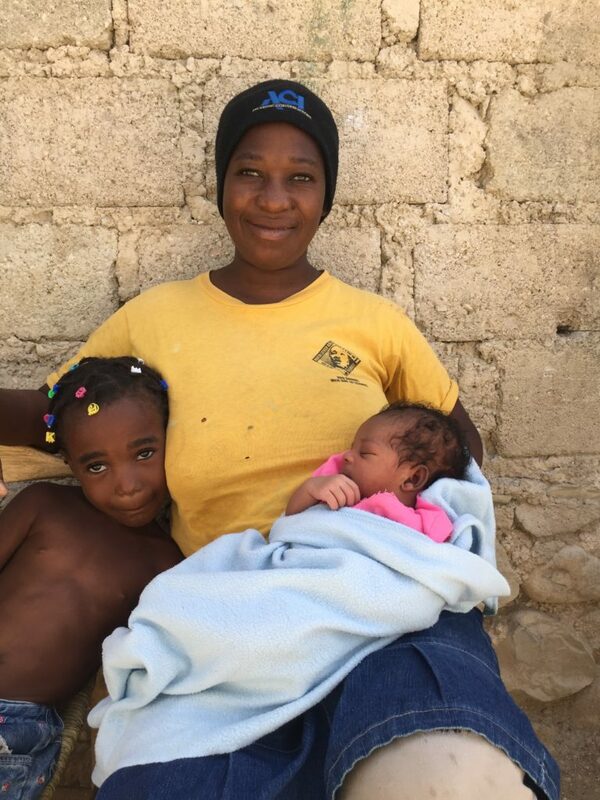 Her baby’s father is supporting her now, but he isn’t willing to support her older children, and she has no money right now to send them to school next year. She’s feeling better, and would be almost ready to go back to work, but doesn’t yet know when she’ll be able to get her hands on the initial investment that she will need. This entry was posted in After Graduation, Chemen Lavi Miyo, Graduates Who Migrate on July 7, 2018 by Steven Werlin. Daniela was once a charcoal merchant. She never had enough capital to establish a large business, but she would buy a few sacks each week in the countryside around her home in a rural neighborhood outside of Gwomòn and sell them to the merchants who sit in the downtown market and sell it by the sack. Her husband was a hard-working farmer, and together their income enabled them to just get by. Things took a turn for the worse for the family as Daniela’s husband grew ill. Persistent stomachaches weakened him. They both made him a less capable contributor to the household and created a drain on the family’s resources as they paid for medical care for him. By the time Daniela joined the CLM program, her charcoal business was long gone and she was her family’s sole support. 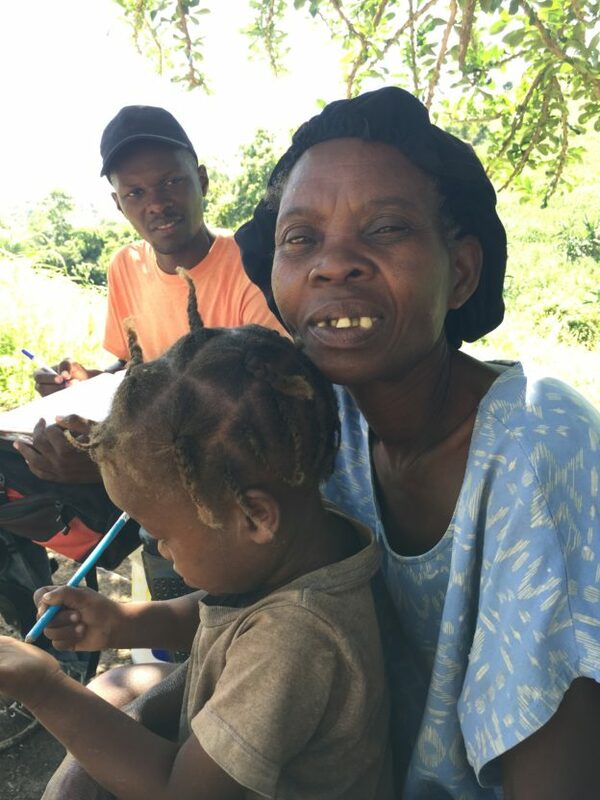 “Se mwen ki rele, mwen ki reponn.” That means “I’m the one who calls, and I’m the one who answers,” and in the Haitian countryside it’s a standard way to say that Daniela herself had to find a way to meet to all her family’s needs. That extends to her home repair, which is proceeding slowly because she has to carry all the rocks and clay that her builder needs herself. She chose goats and a pig as the two enterprises for us to give her, and she hasn’t been able to make much out of them yet. Pig-rearing is a high-risk, high-reward proposition, and her pig died. She was able to sell the carcass to a butcher for 1500 gourds, but she hasn’t collected the money yet. Butchers who buy an animal that is already sick or dead know that their bargaining position is strong, so they rarely pay cash. The woman who bought Daniela’s pig said that she’d pay for it in July. 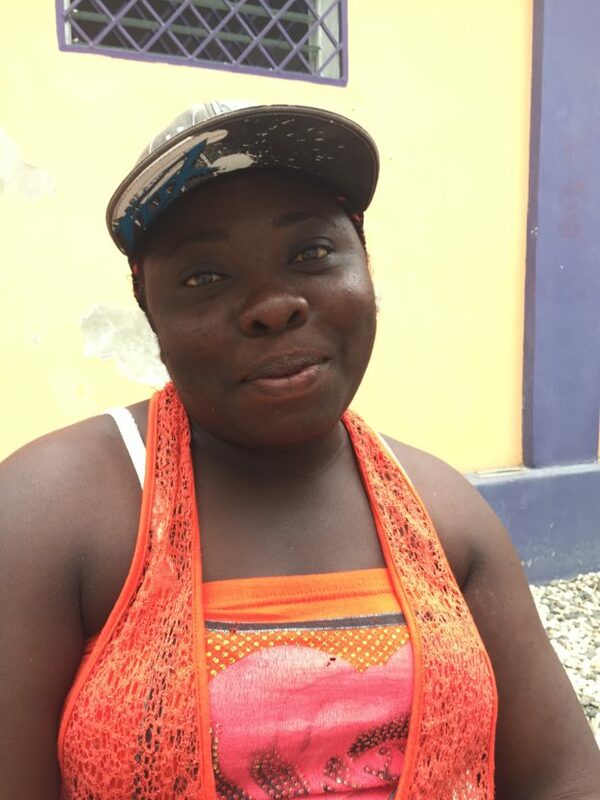 Daniela is hoping that she’ll be able to re-establish her charcoal business when she collects the money. Her two goats are still just two goats. She also uses the income to buy shares in the two VSLAs she belongs to. VSLAs, or Village Savings and Loan Associations, are small clubs that meet every week. At each meeting, participants buy from one to three shares at a price they have collectively determined. The shares become loan capital that club members can then borrow. They repay the loans with interest, so at the end of a one-year cycle, when the club separates the pot, the shares have accrued interest. Then the association reforms for another one-year cycle. Daniela was in one even before she joined CLM. A team from CARE had established them in her area. But she had ceased to be able to buy shares. Now she can buy shares every week in both that VSLA and the one that CLM established. This entry was posted in Chemen Lavi Miyo on June 22, 2018 by Steven Werlin. Sonia is from Montay Terib, or Terrible Mountain, a mountainous area of Sodo, lodged between the fertile center of the commune and the coastal plain to the west. Though it is not especially far from large population centers in Kabarè, Sodo, and even Pòtoprens, it is nevertheless remote. There is no road to or through it that even a motorcycle – much less a car or truck – could travel. All transportation requires walking. She joined the CLM program in 2011. At the time, she had three children, the youngest a nursing infant. “They took me into the program because I had nothing going on. I was living in misery.” Her family was regularly going hungry. She chose goats and a pig as her two enterprises, and got to work. By the time she graduated in 2013, she had made a lot of progress. Not the spectacular progress that we sometimes see, but she had increased the value of her livestock by 50%, and her family was eating two meals each day. She also had a plan. She wanted to continue to increase her livestock until she had enough so that she’d be able to sell some and buy a mule. A pack animal would help her establish commerce, buying agricultural goods around Montay Terib and bringing them to market in Kay Micho, Titayen, or Kabarè. Other graduates from Montay Terib entered Fonkoze’s credit program after they graduated, but she decided not to. So, in 2014 Sonia took two of her children – her eldest and her baby – and she left. The three moved to Kabarè, a market town north of Pòtoprens, along the coast. She had a sister there whom they could move in with. She got a job as a maid to keep her children fed. But she soon saw that there was no future for her as a maid. She still had two small goats in Montay Terib, so she hiked up and sold them, hiking back down with the money from the sale. She began selling garlic, onions, and leeks in the Kabarè market. She liked being in business. She liked the bustle of the market. But she wasn’t making much money. She was just barely getting by. So, she talked to her brother-in-law, and he explained a different business she might try. It is profitable, but also labor-intensive. Kabarè is an important selling point for produce destined for Pòtoprens, so there are markets three days a week. Every market day, she buys a 50-kilo sack of flour and brings it to a bakery, where they turn it into bread. Then she sits in the market, selling what they’ve made. But she is managing. She has about 4000 gourds in her business – a little over $60 – and in a week of work, she can earn enough to pay her basic household expenses and to make a 750-gourd contribution to her saving club. This entry was posted in After Graduation, Chemen Lavi Miyo, Graduates Who Migrate on June 12, 2018 by Steven Werlin. When Carmène joined the CLM program, she and her husband were living in Platon Zèb, a remote corner of a neighborhood called Laferyè, one of a series of neighborhoods along the ridge that separates the Central Plateau from Pòtoprens. When she entered the program, she and her husband, Yatande, had very little. They had purchased goats with money they earned through a cash-for-work program that cut roads from the national highway in Fon Cheval to the catholic church in Gran Boulay. All had died, however, by the time we met Carmène. Yatande was a homebuilder, but his clients weren’t paying him. Carmène was sometimes able to borrow money to set up a small commerce, but she never could build it up into anything. Clients had trouble paying her, and she didn’t manage it well. Though they had sent their four children to school for the year, they weren’t sure how they were going to pay. By the time she had spent six months in the program, she was advancing quickly. The program uses a special evaluation form at the six-month mark, designed to help us see whether members are on track. Rather than evaluating their progress against graduation criteria, we look a factors that point towards eventual success: whether the member is building friendships, whether she seeks and uses advice from community leaders, whether she has a plan for moving forward, whether she is using the training her case manager provides, and whether her assets have begun to increase their value. Carmène scored 90 out of 100. And, in fact, by the time she underwent her twelve-month evaluation, Carmène could have graduated from the CLM program. Her family was eating hot meals twice-a-day, they had three times the assets we originally had given them, and she was confident in her ability to move forward. Asked whether she thought that Fonkoze should worry about her, she said no and then explained: “I’m going to keep working hard and to manage what I have so it will increase.” When she graduated six months later, she had four times as much as we had given her, having added a horse, a young bull, and a pig to the three goats, which had turned into five. She also had begun a small commerce, selling groceries out of her home. Neighbors could buy rice, beans, oil: whatever they needed to fix a meal. It meant that they had a place to turn if they ran out of something before market day or if they couldn’t get to the market for some reason. 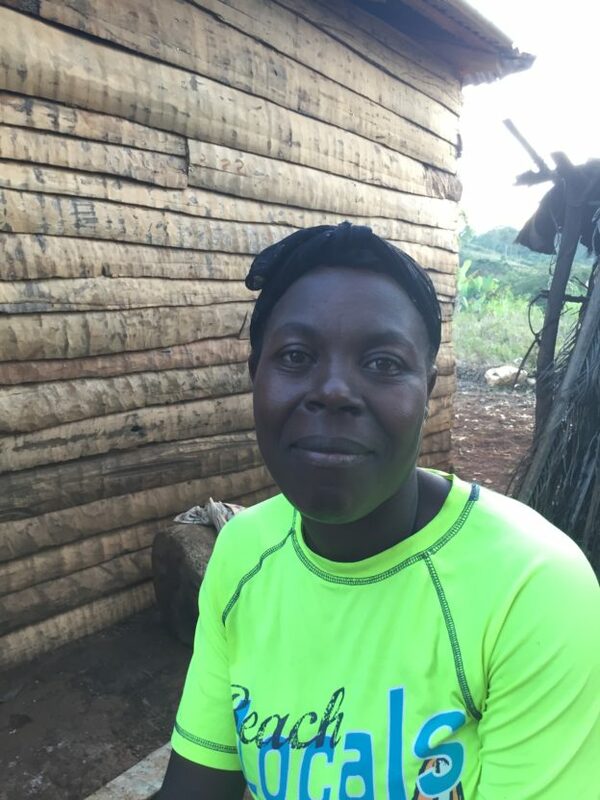 When she graduated, she decided to strengthen her business by joining the credit program offered by Fonkoze’s commercial sister, Fonkoze Financial Services, or SFF. She became part of a solidarity group of five women. All five were CLM graduates. Together they took out their first loans, borrowing 3000 gourds each. The business worked well. Though she couldn’t always collect what her neighbors owed her, most of them paid, and she knew that the ones who didn’t were struggling with problems she had known too well. In 2016, she and Yatande decided to move. Platon Zèb was her home, but he was from Labasti, a market area down the mountain along the main road into Mibalè. They repaired the small bachelor house he had built years earlier on land he purchased as a young man, and moved down the hill. “It is much better for us here. There’s no water in Laferyè. Here there’s plenty.” Yatande is quick to say that he still has work to do. “This is still a man’s house. I haven’t built a woman’s house here yet.” They were, however, careful to install a latrine, complete with a PVC exhaust pipe, just as those that CLM helps members construct. 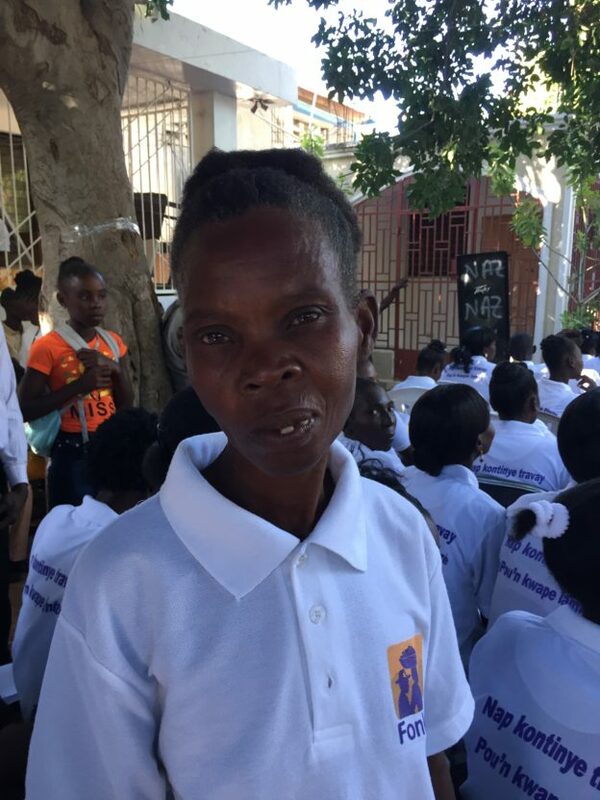 Carmène’s is an encouraging story, but not all the women who graduated with her in December 2014 are doing as well. But she did not own the land the house was on, and its owners were constantly trying to get her to leave because she had nothing she could pay the rent with once the cash-for-work dried up. She had almost nothing: no livestock or any capital she could invest in small commerce. On the scorecard that Fonkoze uses to measure poverty, she scored about a low as one could. She could occasionally get rent money from her younger children’s father, a man named Maxo, but he didn’t pay regularly. That wasn’t the worst of Maxo. He was abusive. Her case manager, Hilaire, had to work hard with her to help her out of the relationship. That work culminated when Maxo attacked her in front of the new home she was struggling to build. Hilaire helped Safine through the process of having Maxo arrested, and then with negotiations with his family, who wanted to keep him out of prison. She eventually received a guarantee that he would leave her alone along with help completing construction of her home. 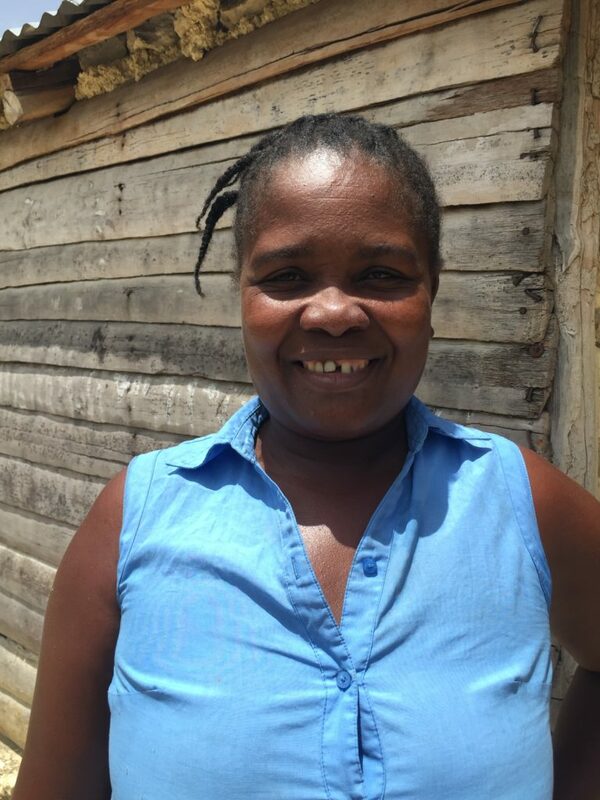 Hilaire also helped her buy a small plot of land that she eventually built a small home on. She chose goats and a pig as her assets, but they didn’t fare well, because she had no place they could graze. And she was too close to the highway. She occasionally lost a young goat to passing traffic. She eventually established a small commerce, and easily met the program’s graduation criteria, but struggled throughout the 18 months. She would occasionally have to spend the money she used for her business buying what she needed to take care of her children. Her case manager would then help her get a job in the kitchen of one of the numerous training workshops that the CLM program provides its members. She could then use that money to re-establish her business. After graduation, she continued to struggle. Her remaining goats died, but she rented a plot of farmland and started to work it. She planted plantains and manioc, crops that would yield both food for her children and something to sell. This year, she’s planting corn as well. She hasn’t been able to sustain her small commerce. She explains, “I get no help from the children’s father. My commerce has to pay school fees, books, uniforms. It buys sandals for their feet and barrettes for the girls’ hair. It pays for the food they eat.” She occasionally goes to Pòtoprens to work as a maid for a while when she doesn’t know what else to do. But she and her children are healthy, and the children continue to go to school, even if she isn’t yet quite sure how she will pay of the balance she owes for the current school year. This entry was posted in After Graduation, Chemen Lavi Miyo on June 4, 2018 by Steven Werlin.